This griddle is moderate yet profoundly flexible. 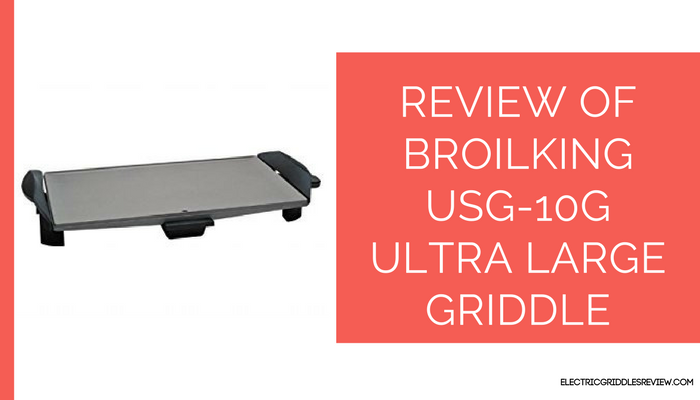 This BroilKing USG-10G Ultra Large Griddle has a big nonstick surface that measures 21”x12”, it is ultra large griddle like its name says and is one of the largest electric griddles. It is made of heavy cast aluminum that makes it heavy unit that takes lot of counter space and probably the storage space as well. It is recommended to have enough room in kitchen countertop and cabinet for its storage. 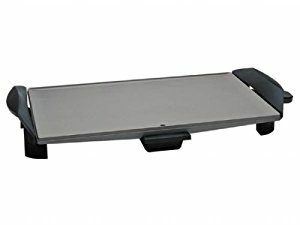 This BroilKing griddle also features the ability to tilt the cooking surface by using its rear legs. Its rear legs can be used to tilt the whole cooking surface so that the fat drains into the removable grease tray. But unlike BroilKing PCG-10 model, it doesn’t have the stainless steel backsplash. May be this is one of the reasons it is cheaper than PCG-10. It doesn’t have splashguard like PCG-10. Also its nonstick coating is not as advanced as PCG-10’s. The foods tend to get stuck more often if the nonstick spray is not used from time to time. But that is not a big problem, as you have to do so with most of the electric griddles in the market. This large electric griddle has nonstick cooking surface so cleaning up is no big deal. The grease tray and the temperature control can be separated from the unit. Removable grease tray and the temperature control allow it to be immersed in the sink for cleaning. The griddle can heat up to 425ºF making your cooking flawless. You can cook large amounts of pancakes, burgers, eggs and other items with this large appliance. Make sure you are aware of the temperature settings. It has been noticed that the unit doesn’t heat evenly and one side gets hotter than the other. Though there are many similarities between the BroilKing PCG-10 and USG-10G, there are few differences that differentiate these two large griddles. Of course, this electric griddle is less cheap and less famous than BroilKing PCG-10, which is why it has fewer features. Also, check the review of BroilKing PCG-10 Professional Portable Nonstick Griddle.